After briefly threatening to veto the $1.3 trillion government spending bill, President Donald Trump signed the measure on Friday, March 23. While lamenting the measure’s many flaws, the president said that it had to be signed in order to fund the military. Trump warned lawmakers that he will never again sign a similar measure and blamed the Democrats for stuffing the budget with wasteful spending. The bill provides an additional $60 billion for the military compared to last year for a total of $654.6 billion. Trump spent a portion of the announcement listing the items that would be purchased with the money: jet fighters, helicopters, tanker jets, ships, and more. “For the last eight years, deep defense cuts have undermined our national security. They’ve hollowed our readiness as a military unit and put America at really grave risk,” Trump said. “There are a lot of things that we shouldn’t have had in this bill but we were in a sense forced if we wanted to build our military we were forced to have,” he added. The bill provides $1.6 billion for the construction of a border wall, far short of the $25 billion Trump fought for. Building the wall was the president’s signature campaign promise, but the budget limits what can be built using the $1.6 billion. The president described the wall as part of national defense, appearing to suggest that the structure may have to be built by the military. “National defense is a very important two words because by having a strong border system, including a wall, we are in a position, militarily, that is very advantageous,” Trump said. Trump placed the blame for not funding the wall on Democrats, saying that the money is tied to the Deferred Action for Childhood Arrival (DACA) program, an Obama-era initiative that granted temporary legal status to over 800,000 aliens who entered the country illegally as minors. Trump ended the program in September and offered the Democrats a deal: the government would revive DACA in exchange for $25 billion for the border wall. The Democrats instead demanded that Trump provide a path to citizenship to an extended pool of aliens. The White House rejected the deal, Fox News reported, citing GOP sources. 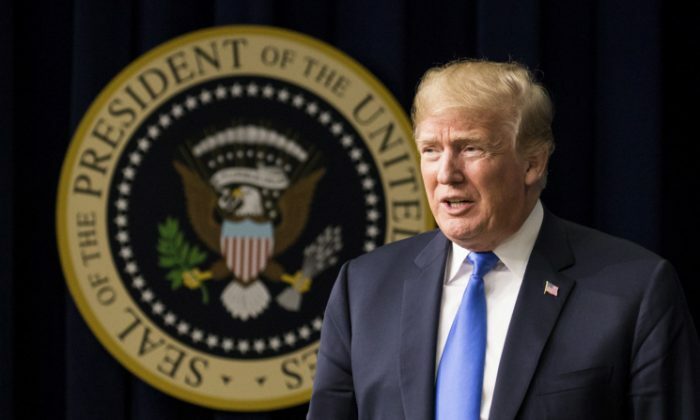 The president also called on Congress to give him the power to veto line items in spending bills which would enable him to strike out specific provisions. He also called on Congress again to end the filibuster rule. Both measures could drastically alter the budget process. Trump highlighted the fact that this would be the second largest spending bill ever signed. The largest spending bill was signed by former president Barack Obama. The bill funds several of the president’s key priorities, including $4 billion for addressing the opioid addiction and abuse epidemic, an increase of $3 billion. The measure also funds Trump’s infrastructure plan and provides money for boosting school safety in the wake of the Florida school shooting. In addition to the border wall funds, the spending bill raised funding for the U.S. Department of Immigration and Customs Enforcement by 10 percent to $621 million and provided $505 million for the Department of Justice to hire and deploy new immigration judges.